Join in making sure #HerVoiceCounts. Women currently make up 4.5 per cent of the prison population in the UK, and it is often said by women in the Criminal Justice System that women are a minority in a system that is designed with men in mind. The low proportion of women in prison has meant that the specific needs of women in the Criminal Justice System (CJS) are often neglected and their voices are not heard. But 80 per cent of these women have been convicted for non-violent offences; 53 per cent have reported experiencing physical, emotional and sexual abuse, and 46 per cent of women in prison have attempted suicide at some point in their life. And then 38 per cent of women who have been sent to prison do not have any accommodation arranged on their release. International Women’s Day celebrates the social, economic, cultural and political achievement of women. It also highlights that progress for gender equality has slowed in many places across the world. But gender disparity in the criminal justice system has often been overlooked, despite the feminist movement’s attempts to be inclusive of all women’s issues. Historically, women and offenders were seen by many to be outside the moral boundaries of society, and some saw this as justifying their marginalisation. And today, when female empowerment is a key concern in societies arounds the globe, the rights of women in the criminal justice system are still excluded from a discussion that is designed to help all women regardless of their status, economic background and life experiences. Why are they not being represented in a conversation that is meant to address the needs of every individual woman? 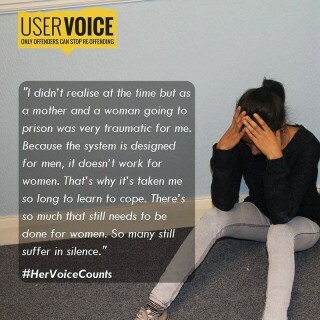 User Voice, a charity set up to stop re-offending, is holding a campaign for International Women’s Day using the hashtag #HerVoiceCounts. #HerVoiceCounts wants to include those who are typically excluded from the conversation and to highlight their accomplishments. The campaign wants to emphasise that women’s rights in the criminal justice system encompass a range of rights that are crucial to the empowerment of women in society. To make sure Her Voice Counts in mental health, Her Voice Counts in housing issues, Her Voice Counts in parental struggles – and Her Voice Counts when celebrating accomplishments. On 8 March 2016 User Voice is making Her Voice Count by giving these marginalised women the opportunity to share their stories. Read what they have to say on the User Voice website, and stay updated using the hashtag #HerVoiceCounts. User Voice was established in 2009 by Mark Johnson, and received its charitable status in 2010. The majority of the staff are ex-offenders, and the aim is to stop re-offending through collaborative work in prisons and the probation service.